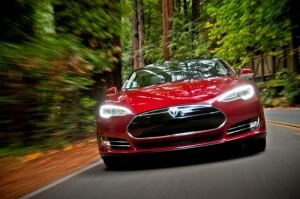 Fisher said the engineering staff at the Consumer’s Union 327-acre test facility in Connecticut agreed that the Model S had the best performance of any vehicle over the past six years and possibly the best score ever in the battery of 50 tests that the organization performs. In tests of acceleration, braking, handling, quietness, ride, and energy efficiency, no other vehicle came close, he told us. But by shooting for a $90,000 price point in this version of the Model S (other versions offer smaller batteries at lower prices), Tesla was able to make use of the best qualities of an electric powertrain. When compared to other $90,000 gasoline-burning vehicles, the Model S makes sense, whereas the Chevy Volt and Nissan Leaf don’t fit as well in their price categories, Fisher said.